Offering you a complete choice of products which include pond liners. 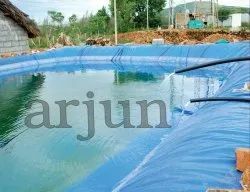 We are the Largest Suppliers of Pondliners in India and we have so far supplied thousands of pondliners and they last for more than 6 - 7 years depending upon the locations.. More the water is saved from being abosrbed into the ground, farmers are able to irrigate more areas and there by they get more yield. Any size can be supplied in Four Hours time.